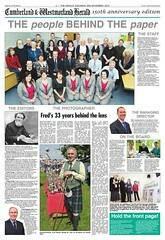 The Cumberland & Westmorland Herald celebrated its 150th birthday with the publication of an anniversary special looking back over the history of the title. 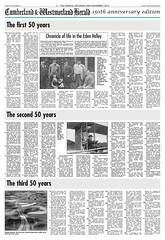 The anniversary edition detailed events covered by the paper in its lifetime and also outlined the title’s role in the community. 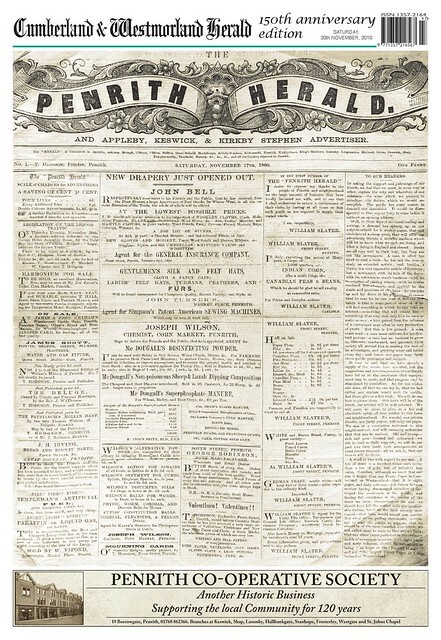 The celebration issue featured a wrap-around cover of the first ever edition of the paper from November, 1860, when it was called the Penrith Herald. The paper also carried a feature outlining to readers how the Herald is run by its 32 staff and also detailing the how the paper has had just seven editor since its launch. The first was Thomas Hodgson, who as editor proprietor launched the Herald in 1860 and remained at the helm until his death in 1913. The paper’s current editor Colin Maughan took control in 1995 and in the years since has introduced full electronic page-make-up and full colour printing while also guiding the paper through the arrival of the internet. Maughan said: “We feel immense pride at having been at the heart of the community for 150 years. ‘It is also extremely gratifying that readers, contributors and advertisers continue to support us at a time of uncertainty for newspapers in general. “We focus solely on local news, recognising that readers want to know about the activities and achievements of their relatives, friends, colleagues and neighbours.